Several weeks ago my friend Julie issued a friendly challenge to me on Facebook: post one nature picture each day for a week. I normally don’t participate in activities like that because most of the time I end up forgetting to take photos or the challenge goes on far too long and I lose interest, but this one intrigued me. “One photo a day…I can do that,” I thought to myself. “And just a week? That’s not too much commitment.” I gladly accepted her challenge (Thanks Julie! If you’re reading this, thanks for putting me up to it. I sure had fun!) and spent the next several days deliberately trying to take photos of nature. This picture is from the fifth or sixth day if my memory serves me properly, and I should probably admit one thing right upfront: it was slightly staged, so while it might not conform to the letter of the law it certainly hits the spirit of the challenge. I took this picture the day after a rainstorm, and it was one of those times where I knew exactly what sort of image I was going for but didn’t quite know if I would find it. With an overcast sky and everything either drenched or starting to dry I figured it wouldn’t be too difficult to find a puddle with something floating in it. 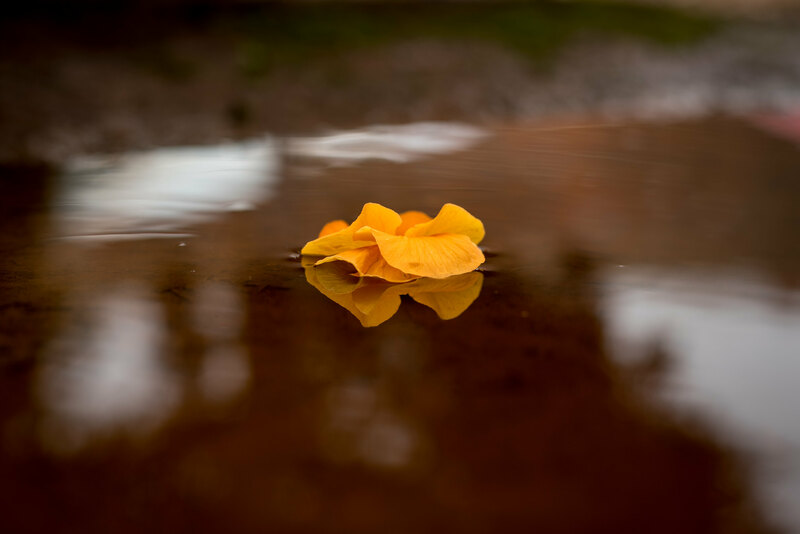 I really wanted to get a picture of a leaf, stick, flower, or something else floating on the water but I also had to find a puddle that wasn’t full of other distracting elements like grass, sticks, or random flotsam and jetsam. I came across a puddle that fit most of the criteria but had nothing floating in it, so I took an oak leaf and set it on the water only to have it immediately sink to the bottom. It was probably a good thing because a brown leaf in a brown puddle on an overcast day would have been fairly depressing. The other consideration here was, as it so often is, depth of field. I needed a sense of context, so shooting at f/1.8 wasn’t an option since the entire foreground and background would be too blurry. f/5.6 resulted in a DOF that was simply too wide, and I finally settled on the sweet spot of f/3.3 which left the flower in focus and just enough context to see that it was floating in a little puddle. I really like the smooth, slightly blurry surface of the water and was overall quite pleased to get this picture. And it was all possible because of Julie’s challenge. Thanks Julie! Very nice! Several things caught my attention about this photo. First, the almost “buttery” smoothness of the water around the flower. You achieved this with a f3.3 aperture! What distance were you from the flower? Second, the micro composition of the flower between the light spots on the surface of the puddle. If anything, this shows the difference between just “snapping a picture” and creating a photograph. Finally, the pronounced contrast between the vibrant yellow color of the flower to the drab and muted brown of the puddle. There are some important lessons to learn from this week’s post. Thank you for helping us with this thing called photography! Thank you for your comments on the photo too, David. I’m so pleased that you like it! Very nice. The color draws you in to the petals and there are no distractions. Very elegant. I would call this Orange Chocolate, for it reminds me of the flavor of Baker’s Chocolate Orange candy. And yes, I am a writer, therefore I associate a lot of things with all of my senses, including smells!! When shopping for my new camera, I wanted the flip out screen too, and for this exact purpose. But the best camera for me was a 7100, which does not have that feature. So, I found myself this week with my head laying on the brick patio trying to properly expose a Mayapple bloom. I’m not complaining, though. I have a wonderful camera. I have been nominated for that challenge four times now. Each time I am very flattered. Each time it motivates me to get out and create. Thank you for always walking us through the process of creating your wonderful photos. A great photo is more than the camera or lens or settings. It comes from dedication and love of the craft. This is the Mayapple I was after. I like this shot from further back, it shows the textures in my shade garden. This one really did have my face on the bricks pearing up at the blooms. Those are gorgeous, Rebecca! And I like how the second one shows the flowers from below, along with the rainy texture on the leaves too. Shots like that require a lot of creative maneuvering but the results are well worth it! I’m picturing you laying down on your back patio with that D7100 and you’re right–a flip-out screen sure would be nice in a situation like that. Keep up the good work Rebecca! BTW I love the scripture verse you included in your header. Is that a recent addition? I don’t remember seeing it before. Thank you for your nice comments, Mar! I appreciate you taking the time to visit the blog and yes, that verse has been there since the very beginning :) No worries though…I often find myself overlooking things like that too! Love this image. So simple, yet so effective!